3.  Electric discharge machining (EDM), sometimes colloquially also referred to as spark machining, spark eroding, burning, die sinking or wire erosion, is a manufacturing process whereby a desired shape is obtained using electrical discharges (sparks). Material is removed from the workpiece by a series of rapidly recurring current discharges between two electrodes, separated by a dielectric liquid and subject to an electric voltage.  One of the electrodes is called the tool-electrode, or simply the ‘tool’ or ‘electrode’, while the other is called the workpiece-electrode, or ‘workpiece’. 4.  The beginning of EDM came during the Second World War, when two Russian physicists B.R. and N.I. Lazarenko published their study on The Inversion of the Electric Discharge Wear Effect. which related to the application to manufacturing technology of the capacity of electrical discharges, under controlled distribution, to remove metal.  EDM was being used at that time to remove broken taps and drills.  The early “Tap- Busters” disintegrated taps with hand fed electrodes, burning a hole in the center of the tap or drill, leaving the remaining fragments that could be picked out.  This saved workpieces and very expensive parts from being scrapped and having to be made over again. 6.  Wire EDM (Vertical EDM's kid brother), is not the new kid on the block.  It was introduced in the late 1960s', and has revolutionized the tool and die, mold, and metalworking industries.  It is probably the most exciting and diversified machine tool developed for this industry in the last fifty years, and has numerous advantages to offer.  It can machine anything that is electrically conductive regardless of the hardness, from relatively common materials such as tool steel, aluminium, copper, and graphite, to exotic space-age alloys including hastaloy, waspaloy, Inconel, titanium, carbide, polycrystalline diamond compacts and conductive ceramics. 7.  The wire does not touch the workpiece, so there is no physical pressure imparted on the workpiece compared to grinding wheels and milling cutters.  The amount of clamping pressure required to hold small, thin and fragile parts is minimal, preventing damage or distortion to the workpiece. 8.  Wire EDM’s are manufactured in various sizes and styles of flush or submerged type machines to fit the needs of the consumer.  Large scale EDM’s can handle workpieces weighing over ten thousand pounds and can cut over twenty inches thick.  Automatic Wire Threaders (AWT) are usually standard equipment on most models.  In addition to the X-Y table travels, wire EDM’s have U / V travels for providing the movement to cut tapers. Most machines can cut tapers of 20-30 degrees depending on workpiece thickness. 9.  The wire EDM in figure represents current technology. The system consists of a CNC control, power supply with anti-electrolysis circuitry, automatic wire threading, hand held pendant, programmable Z-axis, water chiller and filtration system. 12.  The Spark Theory on a wire EDM is basically the same as that of the vertical EDM process.  In wire EDM, the conductive materials are machined with a series of electrical discharges (sparks) that are produced between an accurately positioned moving wire (the electrode) and the workpiece.  High frequency pulses of alternating or direct current is discharged from the wire to the workpiece with a very small spark gap through an insulated dielectric fluid (water).  The heat of each electrical spark, estimated at around 15,000° to 21,000° Fahrenheit, erodes away a tiny bit of material that is vaporized and melted from the workpiece. (Some of the wire material is also eroded away).  These particles (chips) are flushed away from the cut with a stream of de-ionized water through the top and bottom flushing nozzles. 13.  Today’s numerical control is produced with the needs of the operator in mind.  Programs, machine coordinates, cutting speeds, graphics and relevant information is displayed on a color monitor, with easy to use menus.  The numerical control offers the capabilities of scaling, mirror imaging, rotation, axis exchange and assist programs.  This enables an operator to produce an entire family of parts from a single program without the need to edit the program. 14.  Mirror imaging is great for left and right handed parts.  Scaling is useful when working with "shrink factors" for plastic cavities or extrusion dies.  Assist programs find the edge of parts, vertically align the wire, and perform centering routines that are very useful to the operator when setting up jobs.  One of the most important features that the control handles is offset. Programs are created and written for the center of the tool (wire) to follow the outline of the part.  Lets say you are using a .010" diameter wire and it cuts a .012" slot with the power settings provided for the particular material. 15.  When wire EDM machines were first introduced in the United States, they were equipped with power supplies that could achieve less than one square inch per hour.  Today, most machines are rated to cut over twenty square inches per hour and faster.  Faster or slower speeds are obtained depending on the workpiece material, part thickness, wire diameter, type of wire, nozzle position, flushing condition and required part accuracy. .
16.  Adaptive Control is yet another improvement where high speed circuitry has improved the spark gap sensitivity, reaction time of the servo motors, and changes to the power.  With these improved capabilities, wire breakage is reduced to a minimum, making today’s machines far more "forgiving" than in the past. 17. Table movement  Machine movement is accomplished with precision lead screws with recirculating ball bearings on all axes that are driven by AC motors.  Before shipping, the machine’s position is checked and any errors or backlash are corrected by pitch error compensation that is permanently stored in the computers memory. 18.  When wire EDM was first introduced, copper wire was used on the machines because it conducted electricity the best.  But as speeds increased, its limitations were soon discovered.  The low tensile strength of copper wire made it subject to wire breaks when too much tension was applied.  Poor flushability was another problem, due to coppers high thermal conductivity. 19.  Wire diameters range from .004" through .014" with .010" being the most commonly used.  The wire originates from a supply spool, then passes through a tension device (different diameter wires require different amounts of tension to keep it straight).  The wire then passes through a set of precision, round diamond guides, and is then transported into a waste bin.  The wire can only be used once, due to it being eroded from the EDM process. 20.  Most Wire EDM’s are equipped with a programmable "Z" axis giving precise control of the upper guide assembly to ensure accurate tapers.  The rigid U and V axis is positioned away from the work area to avoid moisture, contamination and deflection from the high pressure flush.  These axes provide movement to the top portion of the wire to produce taper angles of up to +/- 30 degrees. 21.  Tapering values can be changed within the program.  This is useful for mold applications or form tools that have different side and frontal taper relief angles.  The machine control knows where the upper and lower guide are in relation to the worktable.  The amount of taper angle, and direction the wire is tilted in relation to the program path is in the program. 22.  Cutting round stock or tubing presents a combination of adverse effects.  Submerged cutting can efficiently cut these jobs without the flush being impaired. 23.  Wire EDM uses deionized water as the dielectric compared to Vertical EDM’s that use oil.  The dielectric system includes the water reservoir, filtration system, deionization system, and water chiller unit.  During cutting, the dirty water is drained into the unfiltered side of the dielectric reservoir where the water is then pumped and filtered through a paper filter, and returned to the clean side of the dielectric tank. 24.  Submerged machining is extremely useful for applications that generally have poor flushing conditions.  Some applications and examples where submerged machining is more practical would be  Cutting large taper angles  Tall workpieces  Laminations  Tubes  Irregular shaped parts  Workpieces with undercuts  Cutting very close to the edge of the workpiece. 25.  When starting a cut from the edge of a workpiece, cutting a form tool, slicing a tube or bar stock, or starting a cut from a large diameter start hole, is a slower process without submerged machining capabilities. 26.  You wouldn't drive your car five years or more without changing the oil.  You wouldn't let ten or more years pass without painting your house.  Well, EDM machines need some tender, loving care too.  But, it's not as bad as you might think! Preventive maintenance on your house (painting) takes twenty hours or more; maintenance on your EDM usually consumes twenty to thirty minutes a week or less. 27. Advantages of Electro discharge machining (EDM)  Smaller holes can be easy machined.  No contact between tool and work piece then tool life is increase.  Any complex shape can be machined. 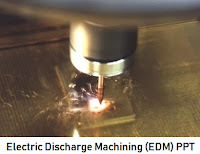 Disadvantages of Electro discharge machining (EDM)  Tool life is not longer.  Power consumption is high.  Cycle time is more.